Technology allows Kentuckians to showcase their products to the world and brings the world marketplace to Kentucky products – if they have high-speed Internet access. Creating a homegrown entrepreneurial culture can’t exist without it. That’s why the British government has declared that its citizens and businesses will have a legal right to high-speed broadband by 2020. And that’s why the Letcher County Broadband Board is focused on overcoming barriers to achieve that essential service for its citizens. Their efforts already have garnered national interest from media organizations such as NPR and Vice News. Currently, a large part of the county does not have that access, which means people must drive to the McDonald’s in Whitesburg to complete basic tasks such as playing a video or downloading photos. Collins cited examples such as the hundreds of jobs provided through Kentucky Teleworks as well as home-based businesses selling arts and crafts through websites such as Etsy. After much research about how to bring that broadband to the home, the board realized the expense would be too great to run fiber to every home. But it would not be dissuaded from its goal. The board is going to issue an RFP to develop an alternative to installing fiber at $65,000 per mile. For one-tenth of the cost, it hopes to create a fixed wireless transmitter solution without running lines. In the meantime, a local cable provider ran 25 mg service to the Campbell’s Branch/Linefork Community Center in Hallie. The site, which was an abandoned school, still had old networking capabilities in place. The board conducted a survey and discovered that citizens needed education about the possibilities of what the Internet could do for them. This site and some assistance from Kentucky Highlands Investment Corporation is helping Letcher County prepare for that future. Through a grant project with financing from the Small Business Administration and USDA, Kentucky Highlands is creating something called K-hubs throughout the region, including one in Letcher County. These gathering spots have high-quality equipment for videoconferencing and training. K-hubs use information technology to increase collaboration, increase the number of recipients of technical assistance and reduce the isolation that rural entrepreneurs often experience. In Letcher County, about 100 participants have learned about the “Internet of Things” and other tools to help them run their own business. Collins expects interest to increase even more when they get closer to achieving high-speed Internet. Collins also is one of several hundred eChampions in the Kentucky Highlands service area. The eChampions initiative provides training and information about resources that enable them to work with entrepreneurs in their own communities, offering them advice and connecting them with organizations that provide technical assistance to existing businesses and people that want to start businesses. It is funded through a USDA Rural Community Development Initiative (RCDI) grant. 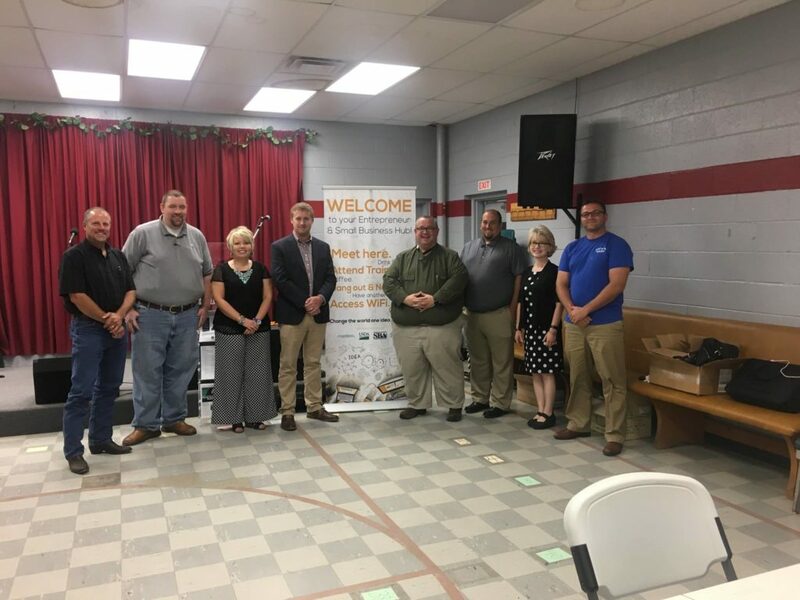 The Kentucky Innovation Network offices in London and Pikeville have also provided technical assistance to entrepreneurs and small businesses in the Campbell’s Branch/Linefork community and other parts of Letcher County.